This must have foot rest truly makes flying enjoyable! 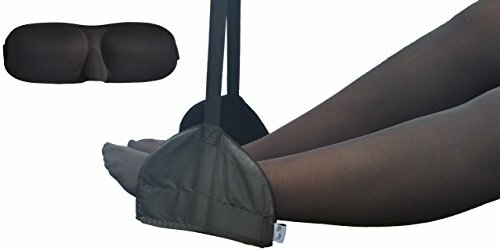 The ergonomically, engineered design (Check out the images), reduces pressure on your lower back and helps prevent swelling in your feet and ankles (DVT). The reinforced stitching and strong straps prevent in-flight breakage. Super easy to attach to the tray table and adjust to the right height. Highly recommended for those 5' 10" or shorter, especially if your feet do not reach the floor when seated. Provides an amazing level of comfort, makes coach feel like 1st class. Includes an contoured, 3-D sleep mask. This well-fitting eye mask is made of soft memory foam. These two make the perfect gift for business women and men, expecting mothers and frequent fliers. Be the envy of your fellow passengers. Risk free, 100% money back guarantee back by world class customer service, order today. If you have any questions about this product by Sleepy Ride, contact us by completing and submitting the form below. If you are looking for a specif part number, please include it with your message.